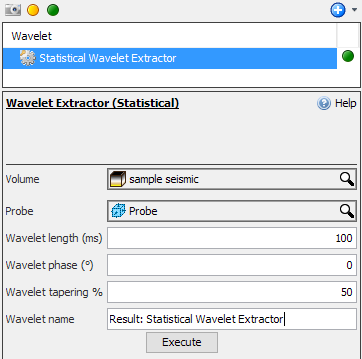 Insight offers a process for statistical wavelet extraction. This process extracts wavelet from seismic data. It considers all input seismic traces within the analysis region specified by the input probe. The frequency spectra of the autocorrelation of all input traces are stacked to produce the wavelet. As a prerequisite, you should define a probe (see Creating a Probe) to specify the block of seismic data to be used in the extraction. You can configure the wavelet length and phase as well as define the wavelet tapering (in percentage of wavelet length) in the extraction process. Calculate the autocorrelation of each trace in the analysis window. Length of the autocorrelation is based on the wavelet length you have defined. Calculate the frequency spectrum of each autocorrelation. Take the square root of the modulus of each frequency spectrum, the zero Hertz component is muted to zero. This step approximates the wavelet spectrum. Take the inverse Fast Fourier Transform (FFT) to extract the wavelet. The output of this process is a wavelet that you can use in Synthetics, modeling and Spectra analysis. 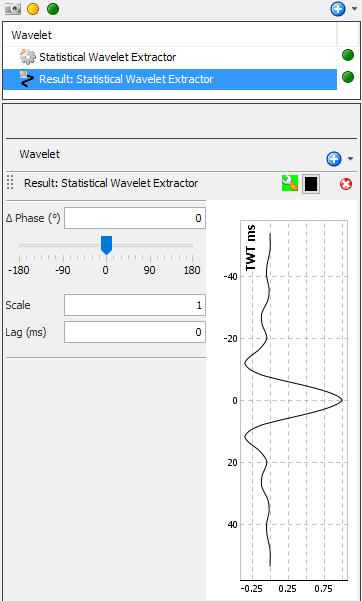 At the tab header, click the Add icon and click New Wavelet Extractor (Statistical). Type a name for the process and click OK. The new process item will be available in the Wavelet tree. In the Details Panel at Volume, select the seismic data to be used in the extraction process. The volume must be sampled in time. If the volume is sampled in depth, configure the Time/Depth Conversion for Insight to perform the conversion. Select a Probe to constrain the seismic traces used in the extraction process. At Wavelet length (ms), define the length of the output wavelet. At Wavelet tapering %, type the percentage of wavelet length to taper the seismic traces down to zero at each end. This value determines the total proportion of the wavelet which is tapered (e.g. 50% tapering means that 25% of the total wavelet from each endpoint is tapered). Type the name of the wavelet at Wavelet name. If you leave this blank, the wavelet name by default will be based on the name of the process that creates it. Click Execute to run the process. Once the process completes, a new wavelet item is available in the Wavelet tree. Save the current session and the wavelet will be saved in the project database.